"Andrew Slattery's filly created a really good impression in three runs last term and didn't look short of pace when she won her Maiden at the Curragh showing a fine turn of foot." We are not overly blessed with big fields for Dundalk's Sunday fixture, but there are one or two interesting races. With three maidens, it's perhaps not the most punter-friendly card, but the 14:35 race throws up a chance for the layers to get after a couple of main contenders. 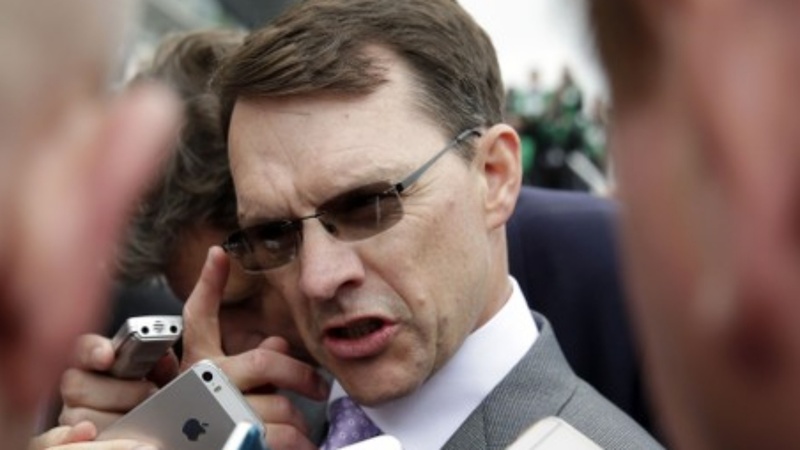 It's a maiden in which Mistress Of Venice holds the higher rating against Aidan O'Brien's frustrating Empire Of State. Whether the former is worth her 93 is a question as she holds it from her 2yo form, and sometimes these sort of horses can be overrated. She also missed the whole of 2018 and subsequently left James Given. She made a perfectly pleasing comeback last time at Navan over 5f - her first run for 581 days. Empire State meanwhile has been beaten favourite four times but performed well-enough from a bad draw at Naas recently. That was over 6f and he drops down again to take on the minimum distance for the first time, which is an interesting angle for a horse that has raced over 7f here. I'm still not convinced about Empire State in a battle, and he's got a few defeats at prices In-Play ranging from [1.11] (at Dundalk), to [1.44]. He seemed to travel well enough up to the halfway point last time, but his finishing effort was a bit tame. Trainer Ger Lyons will be eyeing some nice races this year with Burmese Waltz, and she sets a fair standard for this Rated Race at 15:05. She ran at the top tracks in Maiden company last term; at Leopardstown and Curragh and has also competed at Listed level. Her second to Inverleigh last August reads well, as the third, Could Be King, subsequently went on to race in Group company and finished placed in the 2,000 Guineas Trial last weekend and is now rated 102. Burmese Waltz will be stepping back down in trip from 7f and she certainly has pace. The likely front-runner to take along the field is Empire Line - who is a track regular now with all of his six career runs here with four seconds. He does stay 7f, but travels with enough speed to deal with sprinters, but he has shown he can idle at the end. I would recommend a back-to-lay bet with him. My play in the race is Mid Winster. Andrew Slattery's filly created a really good impression in three runs last term and didn't look short of pace when she won her Maiden at the Curragh showing a fine turn of foot. There were positive on all three of her runs last year and she certainly looks the type who should improve. Her last outing saw her finish a fine third in Listed company behind horses rated 101, 101 and 92. Hopefully she'll be fit to start off well, and she could be set for a good season. I'll throw in a very brief word on the 15:40 Maiden - a race that looks winnable to say the least. Trainer Mick Halford is often the "go-to" man at the track, but his team haven't really got into full stride this term. However, he saddles an interesting newcomer in the shape of Succeedandsurpass. He's bred for the all-weather and has a fine pedigree with an Irish Oaks second, German Oaks and 1,000 Guineas winner in his line. He breezed for 80,000 and might not have to be top-drawer to win this. It will be interesting to see how he goes in the market as this is not a strong race. The handicaps on the card are all fairly low-grade races but I am having a bet on Mick Halford's Miss Snossyboots here. Shes a likeable mare with a good Dundalk record of 132522, and her best trip is today's 1m4f. She won over course and distance last time from the front following on from a good comeback after an absence. The selection will need something near a personal best from a mark of 75, but if she can tack across from her draw, we should have a chance in a field where not too many are well -treated. I will also be watching how the ex-Ralph Beckett horse Construct fares. He was a tricky ride last term, often keen and would run in snatches. He has been gelded and will start for John McConnell for the first time, but his rating of 78 looks stiff. Bets were even harder to chisel out on the Tramore card for Sunday - especially for the first two races so I've skipped them to focus on the 15:20, and a moderate 0-109 event over 2m5f. The top weight Abraham under Denis O'Regan (pictured below) is worth a second-look as he could be well treated from 107, but he isn't exactly in form. However that mark looks one he can win from considering he was running in some good quality Flat handicaps - including a second from 82. He looked a stayer over 1m4f on the level, as befits a son of Hernando. His two most recent jumping efforts were poor in 2018, but they were both after a break. He is fit from a recent spin on the all-weather at Dundalk (behind Miss Snossyboots), and I would give him a chance. The more obvious one is the mare Alohamora, who goes in the first-time blinkers for champion jockey-elect Paul Townend. She is hovering at a mark she can win from undoubtedly, but she is a bit limited. 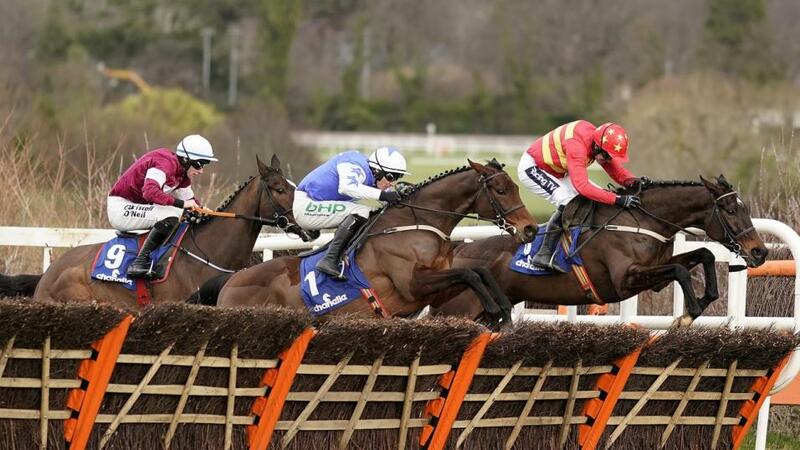 Her latest third at Leopardstown was a solid effort over 3m and she basically got outstayed. She made a nice move over the far side in that race two out to suggest coming back down in trip to 2m5f ought not to be a problem. 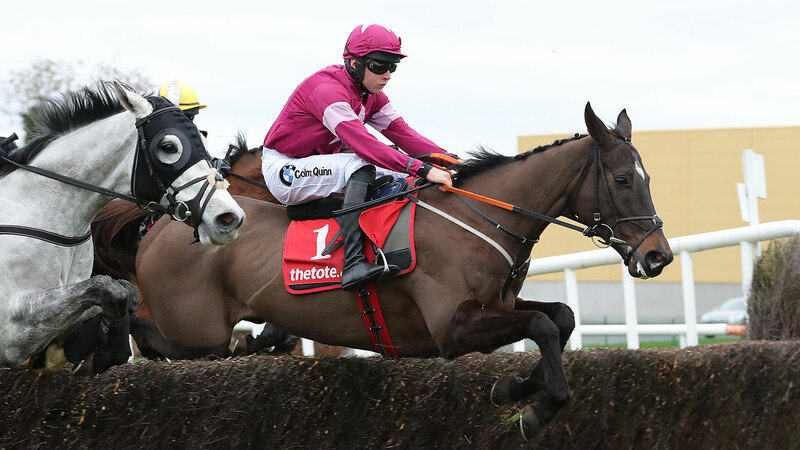 Gordon Elliott's Monatomic hasn't had a lot of luck lately, in fact he is on a recovery mission of sorts following two falls in his last three. 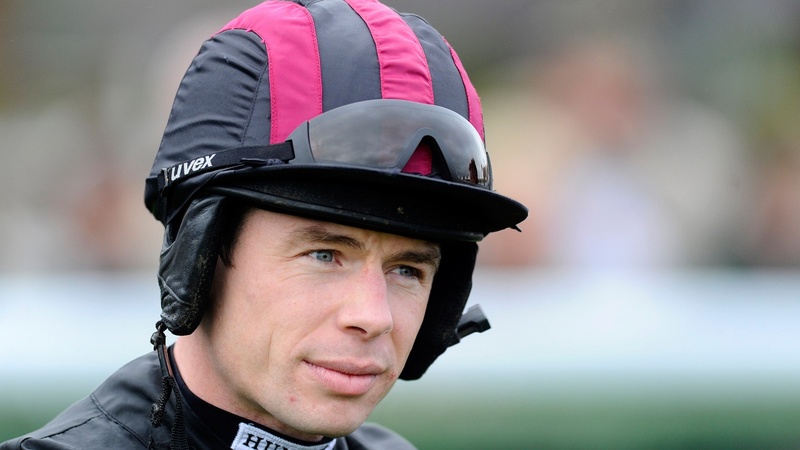 However a return to Tramore is a big plus (and you can click here to read what Elliott says about his chances for Sunday), as he has got some previous here. One of the bits of "previous" with Monatomic was a last fence fall when in total command in October. He would have scored easily that day, and whilst it is no compensation for any of his backers then, he certainly acts well at the track. He also has winning hurdles form here too, so he doesn't mind the speedy nature of the course. Monatomic doesn't do an awful lot in front but has got ability. Willie Mullins was triple-handed at the time of writing, with Augustin, Pylonthepressure and Class Conti. The latter is most interesting as a half-brother to Silviniaco Conti, and he makes his first start in Ireland having joined from France - where he unseated in a race against Janika. I cannot put him up as a bet, as he's a bit of an unknown, but as a 7yo recruit from France, he wouldn't exactly have to be world class to beat Monatomic. Mullins' others probably want more of a trip than today's 2m5f - and Pylonthepressure's jumping doesn't fill with much confidence.